What are the options for homeowners when that “perfect location” doesn’t have the appropriate soils for a standard septic system? There are several solutions to research, and which option you choose may depend on the individual situation encountered. Basically, the tests for appropriate soils will show whether the soil on the parcel has enough permeability to accept effluent from a domestic household source. The soils tester will dig a small pit—the size and depth determined by local code— and pour a volume of water into the hole. The time that it takes for the water to percolate through the soil, leaving the hole relatively water-free is call the percolation rate. Sometimes the wastewater tester will conduct several “perk” tests if the first one or two do not provide appropriate flow rates. If the soils allow the right amount of drainage, then it is likely a traditional septic system, with tank and drain field will be allowed. Drain field size will be determined based on the occupancy (number of bedrooms or bathrooms), the perk rate and other additional factors, including garbage disposals or other water consumption appliances. 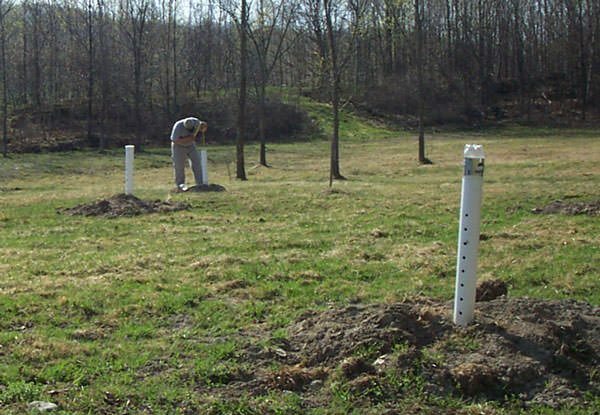 There are several septic options for soils that fail perk tests. Here are some of the solutions soil scientists have developed. Aerobic Septic Systems – Unlike many traditional septic systems the aerobic septic system uses bacteria to process the waste into a much higher quality effluent, enabling the homeowner to reduce the size of the drain field. Aerobically treated effluent may even be sterilized and recycled into irrigation water. An aerobic septic system needs electricity to power the pumps that distribute the secondary stage liquids submerging biofilm that holds the bacteria, then exposing it to air to aid the process. 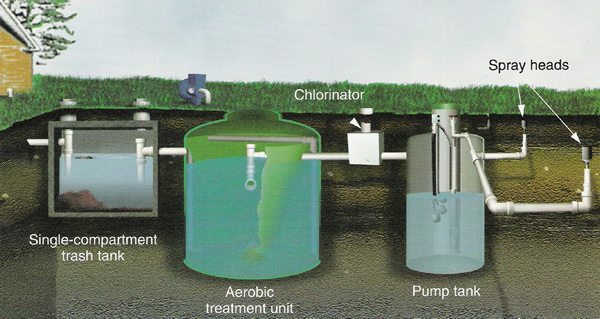 Aerobic septic systems require several hold stages to settle solids and suspended particles from the liquids, and a final tank where the water is treated with chlorine to disinfect the water. The two tanks where solids are collected require regular pumping. 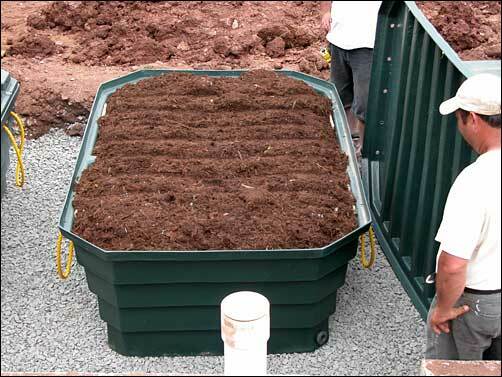 Peat Moss Septic System – If properly designed, a peat moss system is an effective way to handle domestic septic waste. Instead of a bio-engineered medium to aerobically digest waste, peat moss is a natural occurring plant that processes and cleans water materials from effluent as it flows through. “Properly designed” is the key in these systems, as if the moss becomes clogged from too high a waste load or becomes flooded, it may need to be completely replaced. Some municipalities have strict regulations for the disposal of septic peat moss, so you’ll need to check with code enforcement in the area. Sand or Gravel Filter Septic Systems – These systems are constructed with either a sand- or gravel-lined hole located near the septic holding tank. They are often used in areas with high groundwater or fast-percolating soils. If the effluent drains too fast or has no chance for moderate filtering then the septic system could affect well water. Mound Systems – These septic systems are used frequently in areas where thin surface soils or near-surface ledge is apparent. A mound basically creates its own ideal drain field on the top of the existing soil profile. Depending on the size requirements, a mound system can extend to as high as 10-15 feet. Proximity to the home can be a detracting feature on a small building envelope. Mound systems usually require electricity to pump the effluent up to the top of the mound. 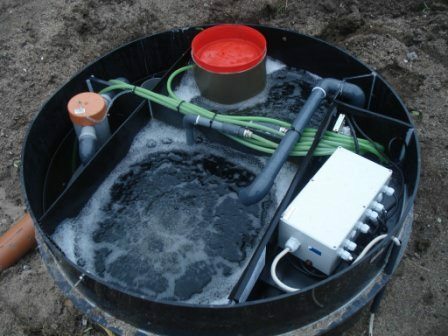 BioKube Wastewater Recycling System— The BioKube system (left and below right)was developed in Denmark and is manufactured and sold in the U.S. by Ashtecs Environmental Co. 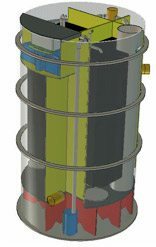 This cylindrical system uses multiple compartments and a reflow system into the septic settling tank to consume the pollutants in septic effluent. The single-family home sized cylinder, which measures 4.5 feet in diameter and seven feet high, contains several chambers. The system uses a small water pump in the bottom, equalizing compartment that pumps every 15 minutes to distribute effluent among the compartments. The BioKube also has two air pumps to pump air into small diffusers to create bubbles and enough oxygen for the hardworking bacteria. According to John Walsh, who brought the BioKube to North Carolina, “The system is set up to maintain the optimal environment of air and food to support the bacterium so that they can consume a maximum amount of ‘food’ supplied by the effluent.” The end result is water that is clean enough for irrigation, or easily drained into a smaller drain field. The septic holding tank is sized 50% larger than a typical tank for a domestic application because the liquid flows back and forth between the tank and the BioKube. This continual processing also decreases the amount of solids settling and can keep pumping maintenance to a minimum. BioKube has been tested and approved primarily in North Carolina and installed along the Outer Banks area where fast-perking, sandy soils prevent the use of typical septic systems. In short, there are options for the site with challenging soils. It’s important to meet with a soils engineer or septic specialist who is familiar with the area where the home will be built. The soils engineer will also be conversant in the regulations and local code requirements for private septic systems.